I think being able to climb mountains, dive in seas, and cycle across continents has ruined the typical city visits for me. This is my fourth visit to Istanbul. I remember loving the city on my previous three visits. But that was before my adventuring began. That was before I started learning there was so much more out there. When I learned I’d be coming to Istanbul on a quick business trip, I made sure to add an extra day to revisit the city I recalled being so enchanted with. It had been several years since I was here and I couldn’t wait to be back. My disenchantment started at the airport. It was run down in a way that reminded me of Cairo’s old airport. The driver that was arranged to take me to my hotel was some 40 minutes late. He blamed the traffic; just the way Egyptians do. We walked out of the airport and I was hit in the face with a thick wall of cigarette smoke. Does everyone here smoke? I had to cover my nose and mouth with the scarf I had thrown around my neck. I could barely breathe. At 4:51 AM (I know the exact time because a very luminous alarm clock was lying next to my bed), my hotel room door opened (yes, as simply as that) and I heard someone starting to walk in. “Heeeyyyyyyyy! !” I yelled as loud as I could. “Oh, I’m sorry. Sorry,” I heard a man say and shut the door back behind him. I got out of bed, opened the door, and yelled down the hallway, “How is it that you can get into people’s rooms? ?” (I never say the right thing in these circumstances). “I’m here for bar lock, madame, and I entered the wrong room. So sorry,” someone replied from two doors down. To get to Istanbul’s old town, I took a taxi to the underground station, rode the underground and then got onto a tram. I could have taken a taxi all the way into town but I wanted to save some money and I also wanted to experience more of the city the way locals would. I eventually arrived at the marvelous Blue Mosque, took a selfie with it because I felt I had to, and then I walked into the mosque. It was flooded with people, everyone holding up their cameras to the exquisitely designed domes. That’s when it started hitting me badly. What has tourism turned into? Nobody just looks at things anymore. I looked around and saw people everywhere getting their pictures (plural) taken inside the mosque. I was certain in most cases it was so they could put them on Facebook. I walked and walked and walked. Then I got tired and got onto a tram. And then I walked and walked and walked again. One of the things I was most looking forward to by coming to Istanbul was to eat some great food. It surrounded me everywhere. 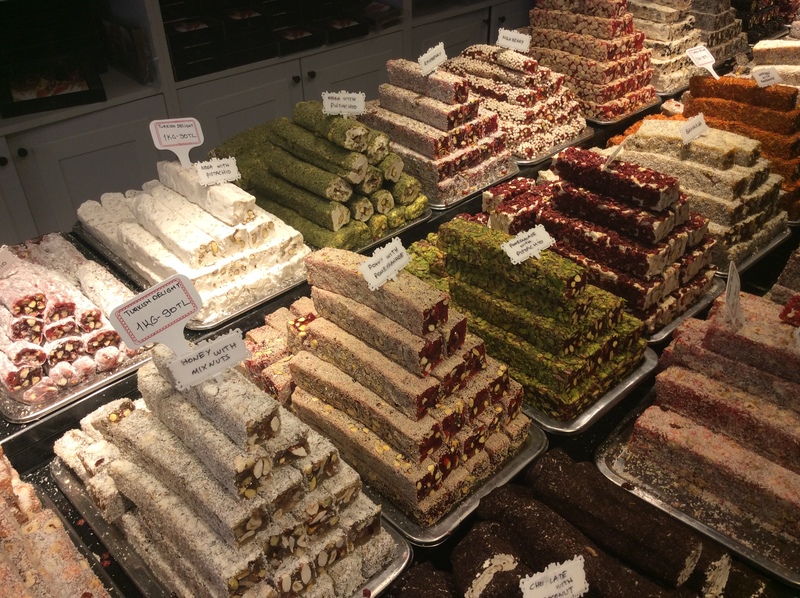 I felt bombarded with Turkish delights, sweets, pastries, kababs… My eyes told me I should be eating them all. My stomach told me if I even tried a single bite it would throw it back up. As I was walking through the center of a major city, feeling like it was similar to almost every other major city I have been through, the bombardment of stimulants made me feel empty inside. I felt soulless. When I’m cycling in the countryside, struggling up a mountaintop, or casually diving along a coral reef, I am always taken aback by the beauty that surrounds me. My soul feels complete. What have we done to our lives? What have we done to our Earth? What have we done to the parts of this world that we inhabit? Our lives have become empty by accumulating so much stuff. Stuff is everywhere: it’s in the concrete slabs we live in, the hyper supermarkets we shop in, the malls we make our ritual pilgrimages to, and we can’t seem to get enough. My problem, of course, is not with Istanbul. It’s with the lifestyle of the big city. Any big city. All big cities. One of my favorite parts of cycling through Europe was to pass through the lazy villages and small towns. They were an example of serenity and simplicity, yet they held so much history and beauty. I think I’ve been put off of big city visits for the time being. I might even have been put off of being in the general vicinity of too many human beings. We seriously need to put the brakes on propagating our progeny, by the way. There are way too many of us and we’re not doing our planet any good. Become a “flaneur”, get off the main strip and out of the centre; very often the suburbs are fascinating. Incidentally I had the same experience recently in the Duomo in Siena but the visited some delightful, and deserted, local churches. Wonderful post. I couldn’t agree with you more. I have just spent 2 months at the cottage in rural Ontario. No TV. No big box stores. No high rises. No traffic. And where backyards are measured in acres – in domes cases 100s of them. I am not anxious to return to big city life. Entirely agree with you : there are too many of us consuming too many things and we are wasting the future of our children, our grand-children, for generations to come. And there are many among us who feel the same way, and feel quite helpless about changing this evolution. I feel the same way when I’m in big cities/very tourist areas..